A cheat that makes you automatically "invisible" whenever you're in sneak mode. 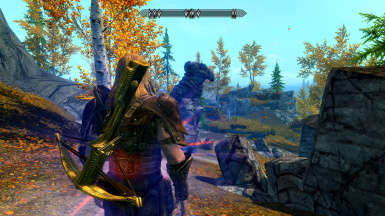 west79, whose mod provided valuable insight to how a Chameleon effect could work in Skyrim. NateFreakingGreat, whose fantastic NOAH mod for Oblivion inspired the Shadow Walk ability. Yes, this is a cheat. I suppose it's a crapshoot as to which category is better for it, Cheats or Stealth, but oh well. 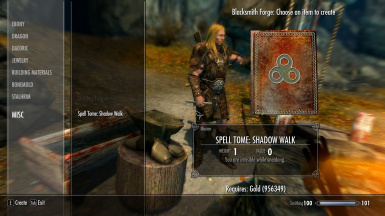 This mods adds the ability to craft Spell Tome: Shadow Walk at any blacksmith forge, for 1 gold. Once you have the tome, read it like you would any other spell tome, and you will gain the constant ability Shadow Walk. 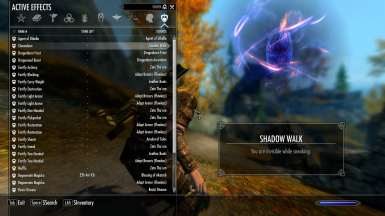 Once you have this ability, from now on, whenever you go into sneak mode, you will turn invisible for as long as you are sneaking, and will turn visible again when you stand up. This does NOT cost any magicka. You can attack things and activate things, but you will still remain invisible. In that sense, the invisibility is more like the Chameleon effect from Morrowind and Oblivion. Please note, you will NOT literally be invisible. 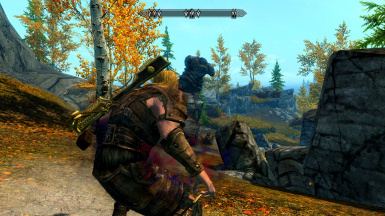 Your body will not disappear; HOWEVER, to NPCs, you are invisible. NPCs will not be able to see you, but you will still be able to see your body. The only thing you will notice, is a little flash whenever you enter and exit sneak mode. This signals the "invisibility" turning on and off. 1. Al's TREASURE VAULT -- Now you have a place to store all your gold and have it display as treasure! 4. Als Shout Like a Dragon - Dragonlike Cooldowns -- Now you can shout as often as dragons can! 1. Al's Elsweyr Rift -- Teleport to and from a one stop shop for selling loot and crafting items from anywhere! 3. Als Thuum of the Magesmith -- Keep the benefits of your enchanted and smithed items even when you switch outfits for a different look! 1. Al's Dead Dragon Giant Camp -- Just as dragon lairs and giant camps are quick and easy (relatively) stops for a rich haul, so is this! 3. Als Revakzoor - Lair of Mythic Dragons - Unfairly Difficult Mod -- A lair laden with treasure, and guarded by six lethal dragons.